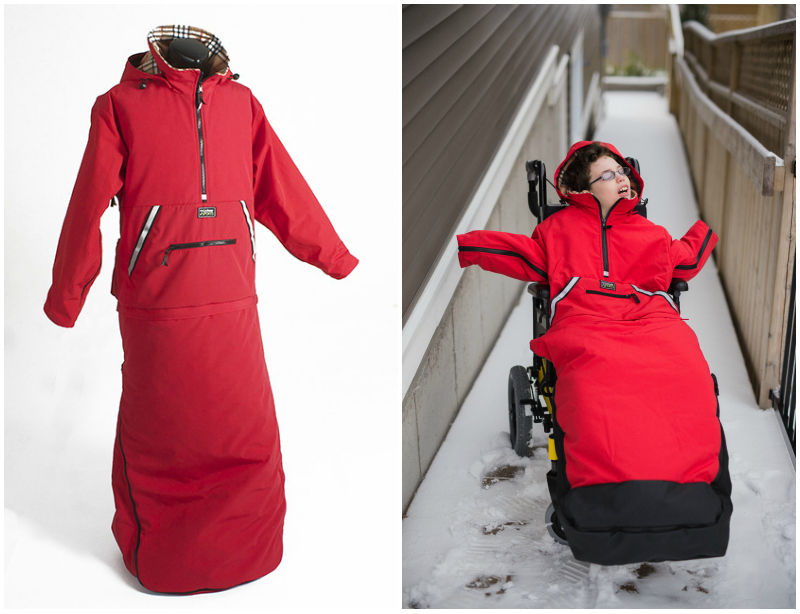 A few months ago, I introduced you to Koolway Sports - a company that designs and manufactures outerwear for people with or without disabilities, enabling them to achieve their maximum level of independence in all aspects of life. With the changing of the seasons, and the first taste of snow, we are preparing for the long Winter ahead. We have always had the challenge of getting Brennen dressed for the cold. His little body gets chilled to the bone if he is not snuggled up in a warm blanket, and if he gets cold outside he is NOT happy. 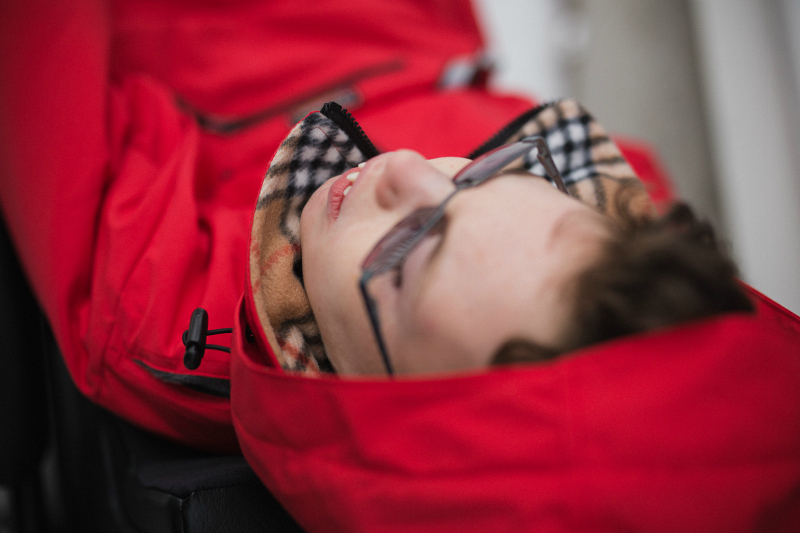 Not only are we faced with the issue of keeping him warm enough, but there is also the struggle of getting his arms out through the sleeves of his coat, fighting against his spasticity. Every year, we end up with a tear under the arm and a hole down at least one side of his coat. Not cool. This year, we invested in a Koolkoat from Koolway Sports and our problems have been solved! My child will NOT be getting cold! The wonderful thing about the Koolkoat is how easily it goes on. It goes over the head like a cape, with a front half-zipper, and then zips down the sides. The Koolway sleeve zipper starts at the wrist cuff and goes up under the arm, down the side of the jacket, to the waist. Both sides unzip fully so that there is no struggle with arms in sleeves. Now, instead of trying to fight Brennen's tight limbs into his jacket, the jacket zips up around his arms. It's genius. 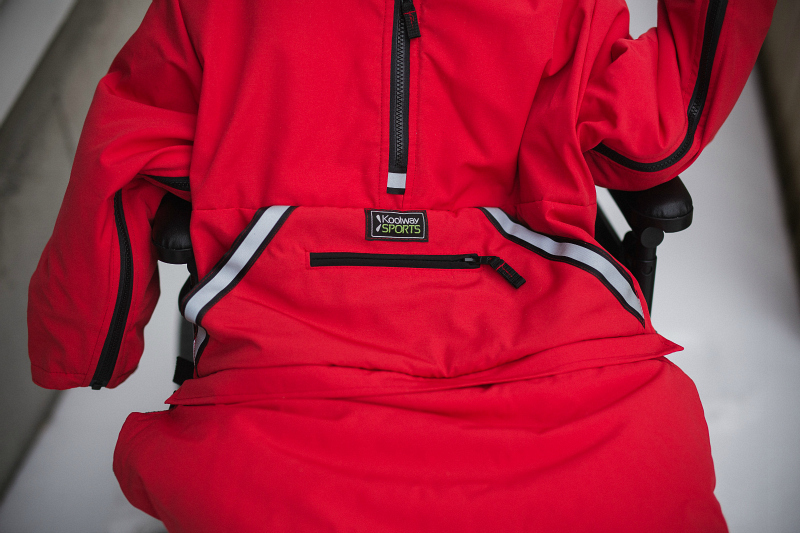 The jacket is custom made to order, sized to fit each individual and their custom chair. It is beautifully crafted and shaped to fit the body, eliminating excess fabric in the lower back. 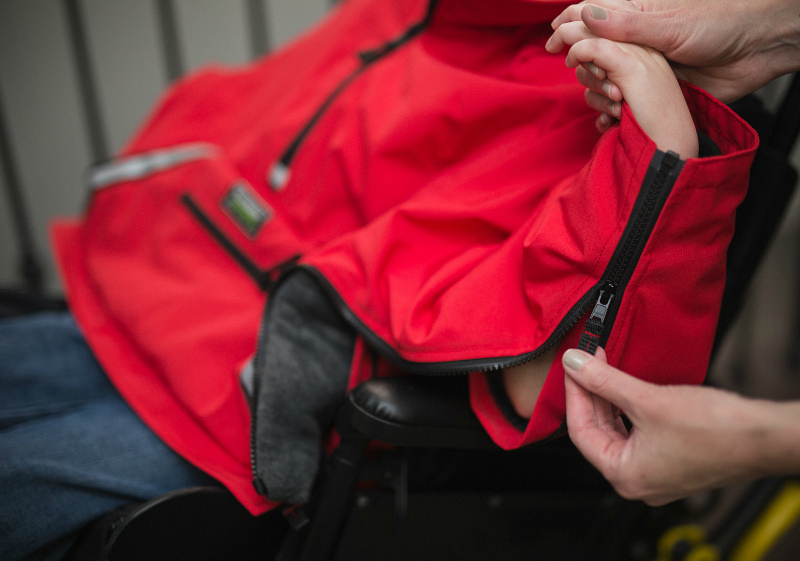 The blanket attachment zips onto the bottom of the jacket, and can be worn over just the legs or over the entire footplate and wheelchair leg framing. It is perfect for when you are going to be spending a longer period of time outdoors - playing in the snow, sliding on the ice, or sitting around a Winter campfire! The black "Slip-Not" on the bottom of Brennen's blanket gives extra protection from the elements such as water, ice and slush, and it is stain and abrasion resistant. The coat and blanket are insulated with Powderfill for extra warmth. It is breathable, moisture-resistant and machine washable. I am so thrilled that we discovered the Koolkoat from Koolway Sports! 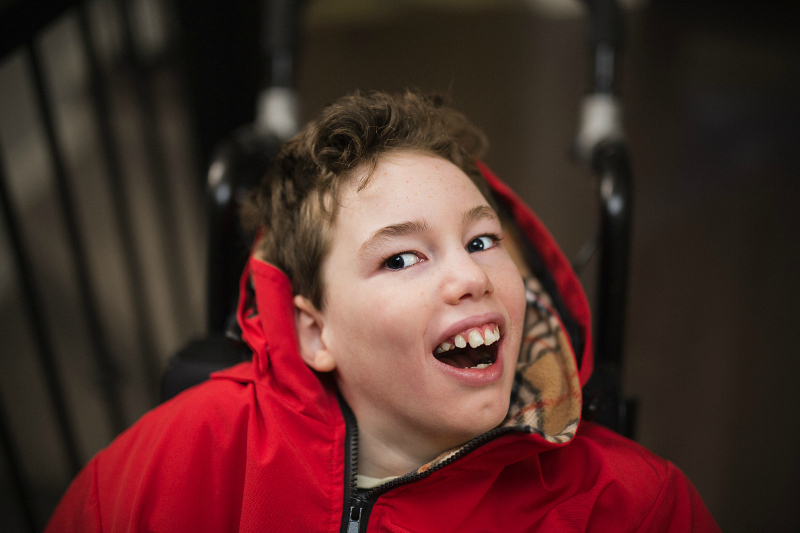 I know that Brennen's coat is going to make a huge difference to him this Winter, and that it will allow us to spend more time outside together as a family. 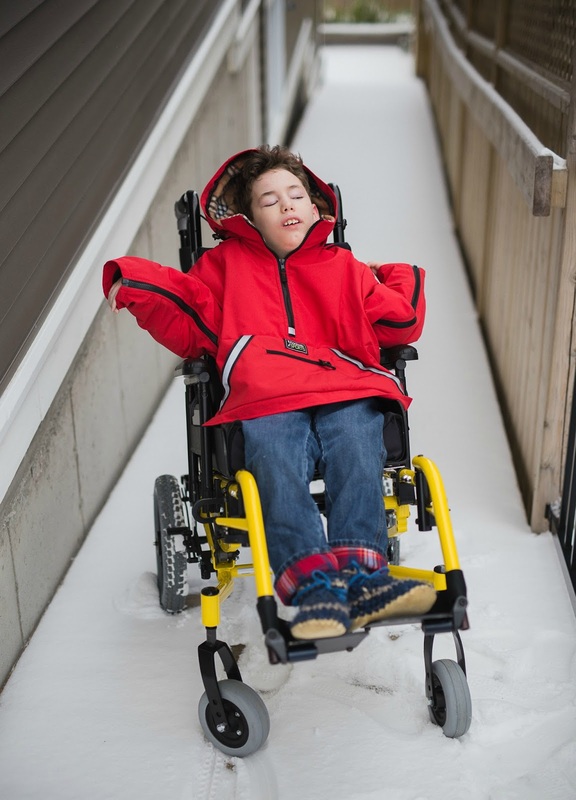 Andrew and I enjoy snowshoeing, and we love to pull Brennen along with us on his sled. We have only ever been able to go for short distances, before Brennen would get too cold, so I'm thinking this year we can tackle some more serious trails! I know it's still early November, but I say, bring on the snowy adventures! We are ready! If you have any questions about the Koolkoat, or any other Koolway products, please feel free to contact me!